All of you know I’m a fan of whole grain flours. I don’t always branch out much into spelt, barley and other seldom used ones. Celine and Tamasin have written the perfect book to explore different kinds of grain flours. I only made 3 recipes, but that’s because we kept eating the tasty results and I have to slow down on the sweets a little for now. However, Whole Grain Baking will be on my kitchen counter so I can grab it when the baking mood hits. There must be dozens of other recipes I have on my list to bake from this awesome book! One of my very favorite things was that the shortbread and scones were made in the food processor. It made short work of the mixing and there was less clean up afterwards. Even though the caramel nut bars are a little more complicated with multiple layers, I was able to put them together quickly on a weeknight. I loved the barley flour in the base and used agave since I was out of brown rice syrup. The instructions are very straight forward. Although some of the flours are expensive, you can make some if you own a powerful blender. 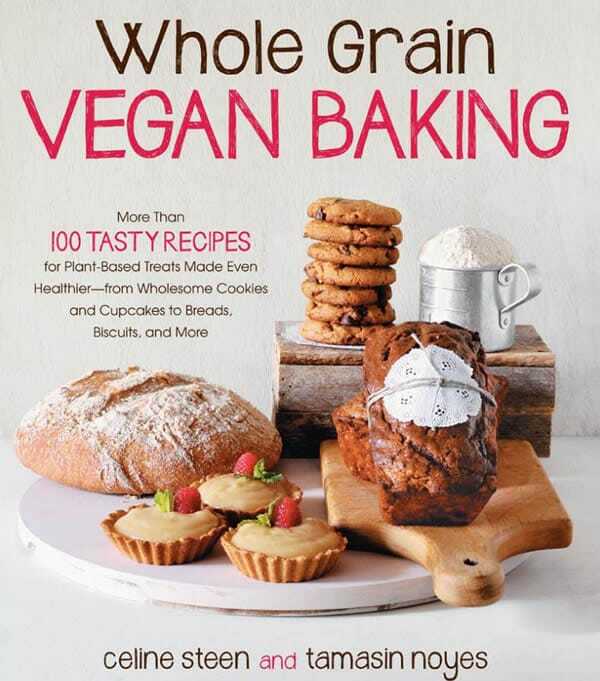 To win a copy of Whole Grain Vegan Baking do one or more of the following. Please note that you will need to leave a separate comment for each task you complete! Leave a comment on this post telling me what your favorite flour to use is. I will announce a winner next week. 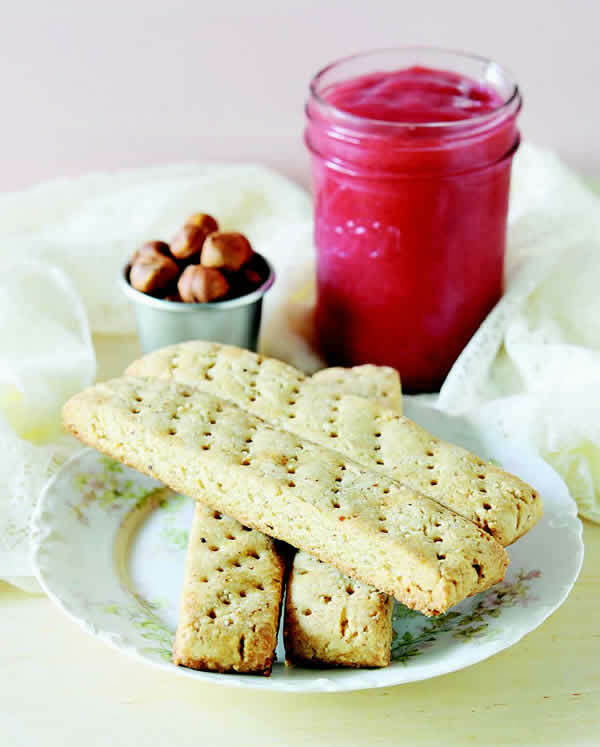 The first recipe I made was this hazelnut shortbread and I just fell in love immediately. It was super simple to make and had that wonderful bite that I expect from shortbread. Plus it has hazelnuts – that makes anything great! Fact: We’ve come to love whole wheat pastry flour so much, we now buy it in 25-pound (11 kg) bags. (Also fact: Our kitchen cupboards, refrigerator, and freezer are officially out of storage room.) This versatile flour is brilliant in the following modestly sweetened, richly flavored shortbread fingers that taste great on their own as well as served in the company of any homemade all-fruit jam, or even better, Raspberry Curd (page 46) or Lemon Curd (page 167). Preheat the oven to 325°F (170°C, or gas mark 3). Combine the hazelnuts, flour, and salt in a food processor. Process until the hazelnuts are finely ground. Add the maple syrup and oil, pulsing to combine. The dough should be kneadable and not crumbly. Place the dough on the prepared sheet, knead it for a couple of beats just to make sure it is cohesive, and press it down with your hands or roll it out to form an 8 x 4-inch (20 x 10 cm) rectangle. For thicker fingers, roll out to form an 8 x 3-inch (20 x 8 cm) rectangle. Cut the rectangle into eight 1-inch (2.5 cm) wide by 4-inch (10 cm) long fingers. Use the tines of a fork to prick the tops of the shortbread. Arrange the fingers on the sheet so that they’re about 1 inch (2.5 cm) apart. Bake for 18 to 22 minutes, or until the fingers are light golden brown around the edges and at the bottom. • If hazelnuts aren’t available, or if you’re simply not a big fan of them, use the same quantity of cashews or almonds instead. • If you’d rather have smaller shortbread fingers, cut the dough into as many shorter, narrower fingers as you wish, but remember to adjust the baking time accordingly. Here are just a few of the other recipes I made. Celine’s photos are so beautiful! 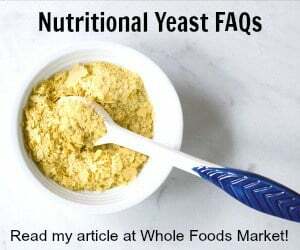 Two of my favorite flours to use are Whole Wheat Pastry flour for wheat based baking, and Quinoa Flour for gluten-free baking. I’ve been eyeing this book for a while now and would love a copy! It’s such a fantastic idea! Oh wow those look great! Beautiful pictures! My favorite flour to cook with is spelt, because it’s so forgiving. However, I’ve been putting myself through a quinoa flour challenge so I can master it! My new favorite flour is almond, but also love coconut, oat, and whole wheat pastry! I pinned the book cover to one of my boards! I really like the taste of almond flour in baked goods. Oat flour is good too. I love baking with almond flour! I like oat flour bc I always have it– just grind up oats! And I like the texture of almond meal– and Trader Joe’s now carries it. Ready to go! So I’d like to experiment more with incorporating it into treats. I like almond and oat flour, and I’ve been hoping to get my hands on some chickpea flour. My favorite flour is chickpea!! Happy mofo to you too! I really enjoy almond-sesame flour (I make my own) and coconut flour. 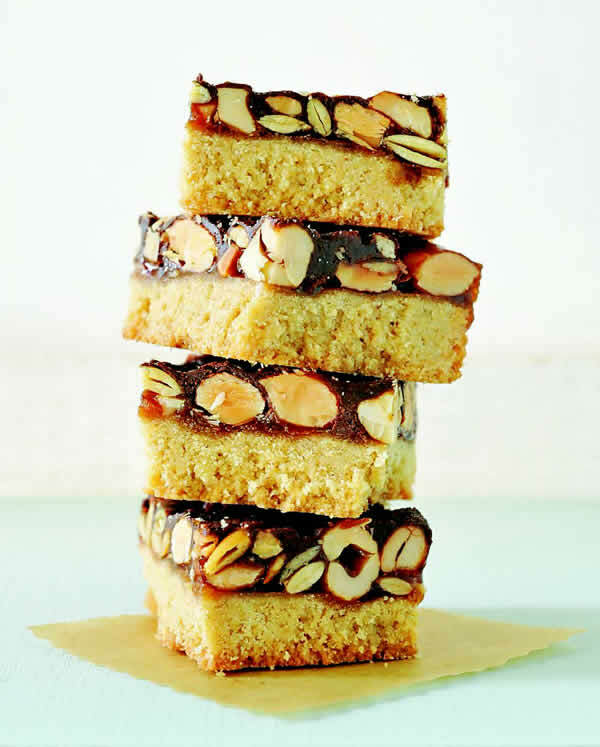 Those hazelnut shortbread fingers look so yummy. I was very happy to see that you use coconut oil in them and not earth balance or other margarine. While I love a good whole wheat flour, I’ve not been making much WW bread lately, because I’m unsatisfied with the quality of the flour I can buy. My mom had an electric wheat grinder, and that probably spoiled me, because anytime I make WW bread, I think it tastes kinda crappy, and wish I had tastier flour. So I actually don’t make bread much, because I don’t want my family eating much white flour in their food, either. Oh Goodness, I haven’t tried very many — Whole Wheat and Almond Flour, I am a vegan newbie (since July ’13) — but so far Almond is by far the family favorite (as if there was a question!). Thanks for the opportunity! I have many favorite flours- It all depends on what I’m making to determine the favorite flour du jour. I do have one un-favorite flour and that is all purpose white flour. It’s a toss-up between white whole wheat and spelt flour. I love both! My favorite flour is whole wheat pastry flour. Rice flours are my favorite to bake with, though it’s a little tricky! Thanks for a delicious looking recipe – we love shortbread! Think I’ll try this with walnuts. I like to bake with graham flour or a mix of whole wheat & graham, but would love to try some others. I’m interested in learning some good vegan recipes. Don’t worry about entering me in the contest….I just went and bought your book. Just wanted to say it looks fantastic! I haven’t gotten any more exotic than whole wheat pastry flour and oat flour… but I’m ready to branch out and this cookbook would be a great way to do it! I love oat flour. Thanks for the giveaway! I like to use spelt flour as well as whole wheat pastry flour! Love your books! I love whole wheat pastry flour! Whole wheat pastry flour and spelt are great flours! OH wow! Now that looks like a MUST HAVE book! 🙂 I would love to learn to bake better! I enjoy baking with whole wheat pastry flour, almond, and coconut flour. My favorite flour to use is sprouted whole wheat. It is healthy, but tastes delicious! I love to use sprouted whole wheat flour. It is healthy and delicious! I have really been liking nut flours – almond and hazelnut are really great to work with. 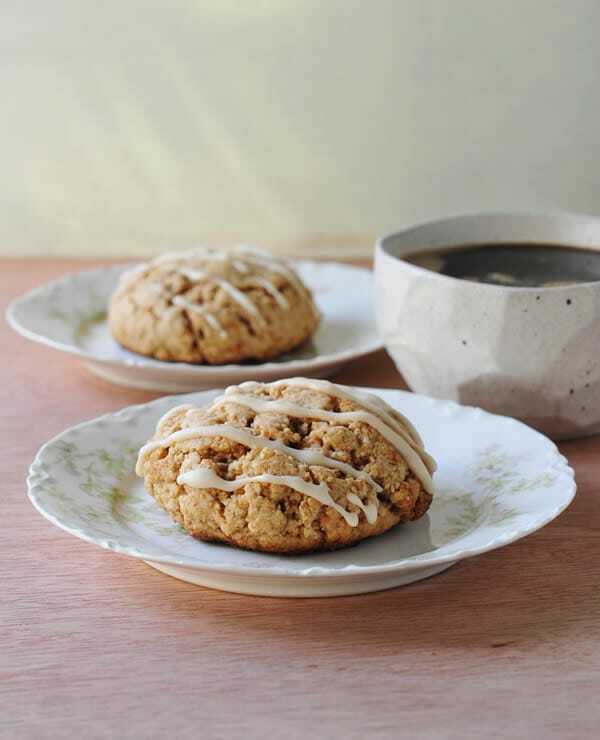 I love spelt flour for baking cookies, it gives a real hearty taste!